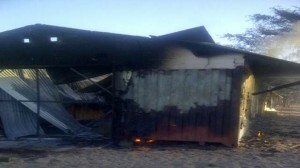 The store room and its entire contents are completely destroyed. This includes all our food stuffs to feed the children, deep freezers, seeds and fertiliser, paint, tools and hardware, stationery, clothing and uniforms, blankets, mattresses, sports equipment, school support material and other recreational items. We have not been able to calculate fully the value of what we have lost but we expect it to be in the $200,000.00 range. 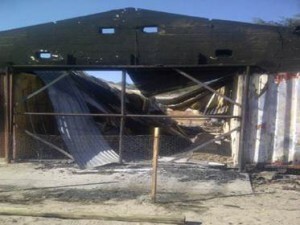 Some of you may have heard about the fire we had at OVC on Thursday. 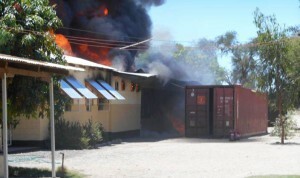 At twelve o’clock I received a phone call to say that there was a fire in the OVC store room. Ruairidh and I quickly rushed over but on arrival found the entire building blanketed in billowing smoke. Despite our best efforts with hoses, buckets and fire extinguishers we could not get to the seat of the fire because of the acrid smoke. 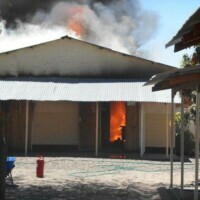 When the fertiliser and paint cans started to explode we realised all was lost and all we could do was to watch the store room burn and try to stop it spreading to nearby buildings and containers. We have insurance for the buildings and contents but due to the policies available here will be limited to around $50,000. We have sent letters to the community asking for assistance from them to help us keep our programmes running, they have started to respond with donations of books, stationary and promises for mealie meal. It is so important we try to keep our programmes running firstly for continuity for the children but secondly the lack of food within the community is obvious thanks to the drought and without our meal a day for the kids most of them will not receive anything due to the stretched food security situation. While we thank you all for the support you give us and your thoughts and prayers at this time any help you can give us to firstly keep our program going and secondly to rebuild and replace lost equipment would be so appreciated. We literally have lost everything, we cannot even do colouring in with the kids at the moment as we have no crayons left. All our stationary, files and archives along with our printer and photo copying toner was also lost so the day to day admin operations of the project are also badly affected. I just can’t quite believe it all. Love I have attached photos for you to see the scale and extent of the damage. Once again thanks for all your thoughts and prayers we need them now more than ever before.